In this episode of JSB Talks Digital I discuss influencer marketing, but more specifically how to audit a social media influencer’s digital footprint. Twitter has released its Q3 2017 results. And their results beat market expectations, showing moderate increases in all key areas. 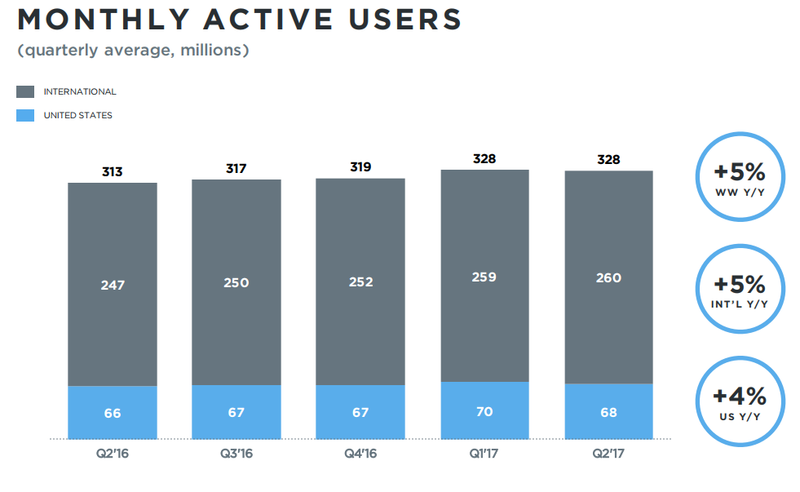 First off, on users – Twitter is now up to 330 million monthly active users, which is an increase of four million on the previous quarter. Twitter did not reveal its full daily active user counts, but CFO Ned Segal said that the figure continues to be less than half of its monthly users, which puts the count at below 165 million DAU (for comparison, Snapchat has 173 million DAU, Instagram has 500 million). On the revenue front, their third quarter income declined 4.2% to $590 million, compared with $616 million a year earlier. But even with that decline, Twitter still beat analyst expectations, which were in the region of $587 million. Facebook’s adding in some new group tools to further enhance group engagement, including welcome notes, member badges and specific group profiles. Facebook’s also officially adding in group member badges. Facebook’s also adding new member profiles which will provide insights relevant to the group. Facebook’s also adding in new, automated tools which can provide guidance on how admins can help expand their communities, with recommendations like when your group is most active (to boost engagement with new content) and how you can help improve your group discoverability (like adding location tags). For us marketers, screen sharing is a really important feature. Well move over Skype, Zoom, GoToWebinar and friends, Facebook is joining the party! When you want to share your screen to Facebook Live, you hit the button on the Live interface that says “Share Screen,” and you’ll be prompted to allow the extension to be installed to your browser. When you click on the Share Screen option for the first time, a pop up will ask if you want to add the “Facebook Screen Sharing” extension. Once installed, you can determine what you want to share by window/application. You can even stream specific tabs. In today’s show I interview Regina Catipon who works as the Marketing Specialist for Intelligent Automation, Inc. Previously she worked in Washington DC’s startup space at Trove and General Assembly. She is interested in data-driven product marketing and innovative spaces. She is a news junkie and a recent transplant of San Francisco. Scraawl is a product of Intelligent Automation, Inc. (IAI), a Rockville, Maryland-based technology innovation company. Our mission is to develop a comprehensive solution for brands to gain actionable insights by listening, searching, extracting, and analyzing social media conversations and large text corpuses. We have developed a set of advanced analytics that leverages the state-of-the-art in big-data, machine learning, natural language processing, and graph theory. Initially released in the Summer of 2015, Scraawl is now a stable and mature, fully supported, enterprise level, commercial analytics platform that is gaining rapid acceptance in the social media analytics product space. Our business case centers on helping brands and agencies understand their global audience, manage customer experience, improve public relations, drive strategic growth, and develop new clients. With analytic capabilities across multiple languages, and its ability to execute on desktops, tablets or mobile devices, our goal is to provide all the analytics a user will ever need ─ at their fingertips, anytime, and anywhere. Influencer marketing and outreach is a powerful way to extend your reach with a target audience without relying on paid media. Influencers have an audience and can drive traffic to your content. This week I’m recommending three ways to find influencers. A number between one to 100 that represents your influence. The more influential you are, the higher your Klout Score. You can also do the same with #hashtags. Search for any you feel might be relevant, to find the most prevalent people talking about them on Twitter, Pinterest, and Instagram. Ask JSB brings the voices of my listeners onto the show. I’m always hunting for new ideas for my podcast, blog and blog and I find the best inspiration comes from questions from my community. If you want to hear your voice on JSB Talks Digital simply log on to www.digitaltraining.ie/askjsb and leave me your voicemail. Tune in to listen to my answer. In today’s column, I’m giving you a step-by-step guide on how audit the digital footprint of a social media influencer. The Digital Age has transformed the business of communications for PR and marketing professionals. In a world where the battle for visibility is based on vanity metrics, community and influence, how do we engage digital influencers. In my view, digital influence has three core components, all of which are required for one to be considered a digital influencer. The social web has given us all the remarkable opportunity to promote our brand, get visibility on our content and have an international voice. Social media is a noisy space and for that reason, we are seeing the mass shift to online communities. So when you build up a community of people who are interested in your topic you can truly begin your journey to influence. Having an online tribe is not enough. You need an engaged tribe. This means that when you do a ‘shout-out’ they will act, when you seek feedback they will provide it and when you are being trolled, they will come to your defence. Digital influencers are in almost every walk of life and industry but how they deliver a return on investment will differ according to the client requirements, and this is where the communications professional plays a key role. In the age of social media, it’s very easy to become obsessed and distracted by vanity metrics i.e. Likes and Followers. If you are responsible for investing in digital influencers for your own brand or a client brand, you have a responsibility to do due diligence on that collaboration. This is why I’ve put together this guide on how to engage effectively with digital influencers. And of course, they must share an interest in the topic you want them to talk about. If you want to know more about influencer marketing strategy then get in touch. Simply drop me an email to joanne@digitaltraining.ie. The social media tool that saved my working week this week is Outreach Plus. Once you have discovered and audited the perfect influencers to work with, your next step is to do outreach. OutreachPlus is a new email marketing outreach tool from Marketing Tech expert Ian Cleary founder of RazorSocial. His new platform is designed to help agencies, brands or publishers to generate more leads, links, press and relationships. Hey Joanne, thanks for the mention!! !